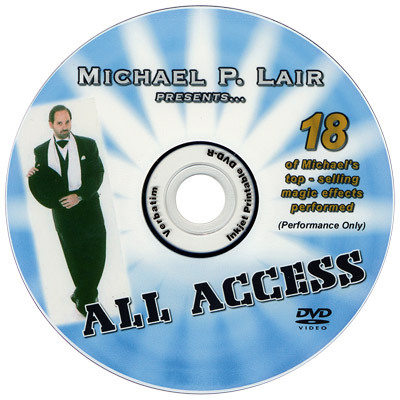 The All Access DVD shows 18 of Michael P. Lair's top-selling effects performed. You will see performance only of: Animated Origami Bill, Beach Memories, Big Coins!, Candle Rewind, Cane Fire, Chinese Appearing Sword, Chinese Fan, Chinese Lucky Envelope, Cool Coil, Fanfire, Firefall, Fire Flower/Rose Coil, Fire to Silk, Hot Coil, Silver Coil, Spitfire, Sponge Poker, and 20-Oz. Production. If you are interested in magic that is visual, then you need this All Access DVD!